BioBubble Terraruim Reptile Habitat 24" x 15.25" x 25",A modular and expandable terrarium for reptiles. 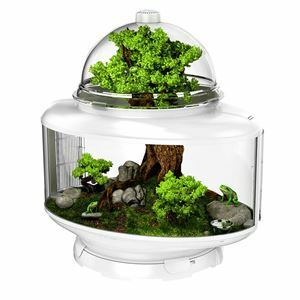 BioBubble Terraruim Reptile Habitat 24" x 15.25" x 25"
The BioBubble Terrarium is a groundbreaking habitat that introduces modular and expandable terrariums to the hobbyist. Combining advanced innovation with modern design, now you can take your terrarium and make it a centerpiece in any room of the home or office. It comes with Vented Cap, crystal clear dome for 360 degree viewing, BioClips to secure the dome and riser together, BioScreen for mounting lighting or separating multiple species, safe non-glass Riser with crystal clear panels and two vented doors, removable Bedding Tray for easy upkeep, Terra Base designed to work with Biobubble Risers and accessories. Dimensions: 24" x 15.25" x 25"